For all the fear in Europe I'm finding good value, but not screaming bargains. My dream is finding companies like Precia selling for less than NCAV, but the only place that exists right now is Japan. Instead of once in a life time bargains the European situation is making good companies cheap, Precia Molen is one of those. This company almost forced itself upon me, I received some comments and emails praising it after my post on Gévelot, it appeared on the list of comparables for Gévelot, a list Geoff Gannon created, and a trusted investing friend recommended I look at it, how could I not? The easiest way to describe Precia is that they enable customers to weigh things. They build scales and scale systems that range from small scales a laboratory might use to a scale system used at a truck weight station. The scales I find most fascinating are their continuous scales. A scale of this sort is installed onto a manufacturing assembly and will constantly evaluate volume or product weight. A distinction I feel I need to make about their product is it's geared toward high usage applications. They don't just make scales that people use to weigh things, they make scales that are integral in a customer's process. In a manufacturing setting if a scale is broken a machine won't know when to stop filling packaging. If a scale breaks in a lab researchers won't be able to conduct experiments. I don't say this to mean that Precia has a moat, I don't think they have any sort of competitive advantage at all. But I want to point this out because their product is a necessity. A client will find a way to replace their product if it breaks, they can't defer replacement until times get better. This is important because scales that are used often will eventually wear out no matter how well built they are. 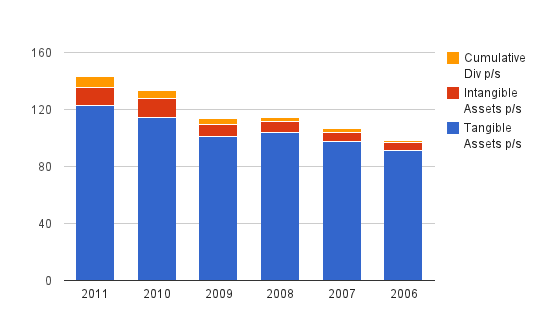 A company that's been consistently growing profits the past ten years while steadily growing book value deserves to trade above book value with a P/E higher than 7.8 and a EV/EBIT higher than 3.6x. 43% of the market cap is composed of cash. 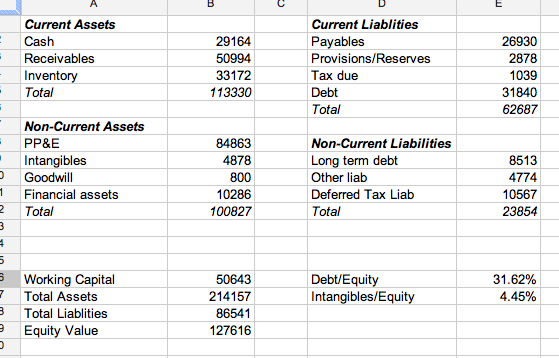 Debt is 21% of equity and interest is covered 38 times. Expanding into India, Morocco, Brazil and Romania. The macro outlook is cloudy in Europe, but Precia believes that 2012 should be similar based on current demand. This could obviously change at any time, but this is better than what Gévelot's management said, they said they were feeling the pressure and doing their best to react. 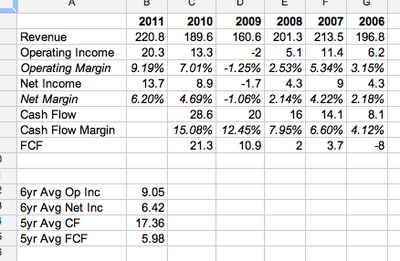 I put together a little spreadsheet showing earnings, earnings per share, and the growth rate for the past ten years. The reason I did this was I wanted to see if a slowdown in earnings growth was leading to their undervaluation. Often a company that is consistently growing will be punished by the market when growth slows. I think this spreadsheet shows pretty well that while earnings have grown solidly it hasn't been a straight line, and each year hasn't blown out the last like Apple does. The results have been lumpy, but lumpy in the right direction. One thing that always makes a deep value person like myself nervous when looking at a company like Precia is I want to see where the cash is going. Are shareholders being rewarded by purchasing and holding onto this company? I created two graphs to show that I believe that's the case with Precia. A lot of the reason this company is cheap is it happens to be located in the wrong spot, in Europe where business is set to seize up and everyone will be living on the streets soon (well at least if you read US media). Looking beyond the hype there are a lot of headwinds facing companies over there, reduced demand, and increased financing costs to name two. I really thought this over for Precia, how will this company fare? Will I be looking back in two years wishing I would have just had cash and avoided the investment? I took a step away from the headlines and thought about Precia's business and clients. I have no reason to believe Precia's scales are of anything other than average quality. The fact remains they're used often and they're high volume products. Putting something heavy on top of a scale day after day will eventually wear the scale out no matter how well it's manufactured. If these scales are integral to client processes the clients will be forced to upgrade no matter what the financial situation is. They might pressure Precia to reduce their prices, but they will eventually need to upgrade their scale. If not through Precia through a competitor. Based on my experience with manufacturing companies if they have someone build out a system for them in almost all cases they will have that same company service it, and if the system lasts they'll have the same company replace it as well. I should mention here the company isn't immune, they took a write down in the beginning of 2011 over their Irish operations. The goodwill impairment was small around €300,000, but they were still impacted. I read a fair amount about Precia, read through their annual report and looked back at their history asking myself "why shouldn't I invest?" I couldn't come up with a good reason. This isn't the cheapest investment I've ever found, but if the company executes in the future in a similar manner to how they have in the past I think this is a very good value buying almost exactly at book value. I was initially disappointed that I wasn't finding quality net-net and cheap book value stocks in Europe. Then I realized that if I fill out a portion of my portfolio with companies like Precia Molen at very reasonable valuations I will do fine over time. This isn't the sort of investment that's going to return 75% in the next year, but I think in five or ten years I'm going to be very satisfied. One number, sometimes that's all an investment revolves around, just one single number. Sure other things need to be considered and weighted, but everything hangs in the balance on that one solitary number. Get the number wrong and the investment fails, get the number right and even with other errors things will still work in your favor. Not many investments can be condensed down to a specific number, Aztec Land and Cattle company can. Aztec Land and Cattle is a simple company, they own land, lots of ranch land in Arizona, 228,040 acres to be exact. The company started back around the time of the civil war acquiring a million acres of land in for the price of 50¢ an acre. Through the years the land was ranched and parcels sold off until Aztec was left with its current 228,040 acres around the area of Snowflake AZ. The land is currently used for cattle grazing generating a modest income for the company. The company has financial statements which they make available to shareholders, but those don't matter all that much to this investment, what really matters, the one number that matters is what is that land worth? Most people have a quick negative reaction when hearing Arizona, land and value in the same sentence. But the question should be framed differently, "Is ranch land in Arizona really only worth $49 an acre?" I'm no expert, but $49/acre seems awfully cheap, unreasonably cheap. And when I see something unreasonably cheap my ears perk up.. If Aztec was content leasing out their land for grazing and never intended to do anything with the land this investment wouldn't really be that interesting. What makes it interesting is that the company has put together a plan to actually monetize the asset. The plan is hosted on their website, but not wanting to crush their server I also uploaded the PDF to Google (it's 158megs!). Aztec built out a comprehensive development plan for both residential and commercial usage. What makes this even more interesting is that due to the size of the land holding they were able to get their plan approved as the official county development plan. What this means is that over the next 30 years as development takes place in Navajo County AZ the development will take place as Aztec has planned it. This has already begun when the state referenced the plan to determine the placement of new roads in the county. Another aspect that makes Aztec interesting, besides the gross acreage the company also owns water rights under their land. The water on Aztec's land includes a few high quality groundwater reserves without detectable drawdown. This in addition to the numerous streams that also run through the property. A second aspect that could make Aztec some money is that a portion of their land is being considered for a wind farm. If the wind farm is approved and built Aztec will receive lease revenue from the windmills. There's a section in the comprehensive plan that discusses this for the curious. The water and wind are both potential catalysts, but the reality is this whole investment rests on the value of the land. So what is that land worth? Aztec's land could be the highest quality land in the world but if they don't have a way to monetize it there isn't much value for shareholders. I did some Googling of local real estate firms near Snowflake AZ looking for raw land zoned for residential and got a range of current values for residentially zoned raw land. I found acreage prices ranging from just over $1000 an acre up to $2700 an acre. I'm sure someone will stop reading here and calculate $2700 * 228,040 = $615m against a $11.1m market cap, think this is a slam dunk and put in a market order, don't do it, keep reading. Another way to look at Aztec's value is how do they value it themselves? In their thin annual report they mention they sold 7,102 acres to their subsidiary for $461,677 which works out to $65 an acre a full 30% higher than the current market price. What we need to think about is that while Aztec's land could eventually have a significantly higher value per acre it's at some point during the next 30 years. The value of the company ultimately rests on how much of their plan is executed and when it's executed. I put together a small spreadsheet outlining some scenarios to show what a potential value for Aztec could be depending on when development begins, and how much of the plan is ultimately executed over the next 30 years. Think of this spreadsheet as educated wild guessing. I used $1000 an acre as my base value and adjusted it up for inflation. I didn't adjust the price up each year, my BAII plus can't quite handle that and I'm not looking for precision, just ranges. The time to develop is the length of time between now and whenever development begins. I think the most reasonable is that development won't start for another 10 years or so and maybe 50% of Aztec's plan is executed. If that happens this company is worth at least double, my suspicion is that the land will eventually sell for more than $1000 an acre, and even if it takes 10 years for the plots to begin the asset conversion process. So is this a buy? I really don't know to be honest. It seems unreasonably cheap at $49/acre, but based on my spreadsheet a lot depends on how long, how much, and for how much. This company intrigues me to no end, it's a chance to own a bit of the wild west stapled to a lottery ticket based on Arizona's eventual growth. If nothing else Aztec Land and Cattle is for patient investors, if you have the ability to hold this for 5, 10 or 15 years I have almost no doubt you'll do well. This is the sort of investment that rewards those with a long time horizon, and the ability to see out past the present negative Arizona sentiment. Disclosure: No position, still thinking it over. I wanted to write a follow up to my post on CIBL from January. The original post is linked here. I don't follow up on too many of my ideas because so far not that many ideas have played out in a way that deserves a post. The CIBL thesis has played out, and there's still a lot of interest in that post, so instead of having people wade through comments to find answers I thought I'd post an update. CIBL was originally a spinoff of assets from the communications company LICT (written up here). The assets CIBL holds are partnership interests in two wireless companies in New Mexico as well as an interest in two TV stations located in Iowa. What made CIBL interesting was that management had indicated that they believed their wireless assets were worth more than the trading value of the shares and they intended to sell them if possible. When I first posted I received a number of comments from burned out shareholders telling me that management had been trotting out that line for a while and they doubted a sale would happen. I'm happy to say they were wrong and a sale is finally pending. On March 23 news hit the wire that CIBL had reached an agreement to sell their wireless partnerships. The long awaited asset monetization had finally come to pass. Now all shareholders had to do was wait for the proxy which outlined the deal. The proxy was posted either late last night or early this morning and can be found here. According to the proxy CIBL sold their partnership interests to Verizon Wireless for $31m which is in the lower end of my range, but still double the market cap at the time of the post. CIBL estimates that the after tax proceeds from the sale will be $18,775,000 which comes out to $750 per share. Of note as well is the process, CIBL was first approached by Verizon in 2008 and was made an offer that CIBL considered too low. 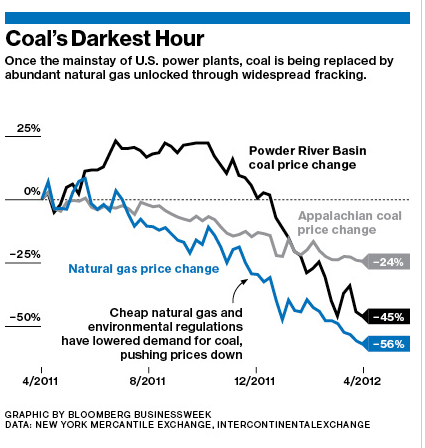 The companies went back and forth for the next four years and finally this winter agreed on the $31m price. The proxy states that this offer is 75% higher than the original Verizon offer. 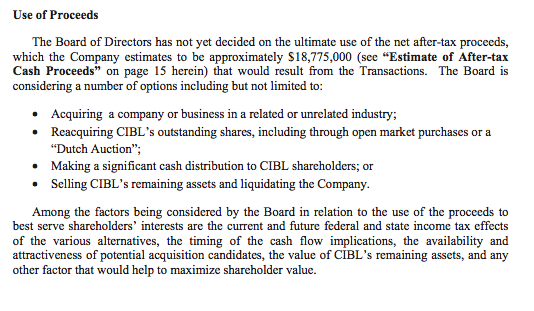 Verizon was and is the only interested buyer, so if CIBL shareholders vote this down it's unlikely someone else will come in with a higher offer. The company doesn't indicate if they have had any interest in selling the TV stations. So if CIBL paid out the entire $750 as a dividend shareholders would be left with $75 in cash and two TV stations that might be worth $200 or so. When I thought about this I came to the conclusion that I'd rather have $950 today if possible rather than wait for a the stations to be sold off and proceeds distributed. So I sold out of my shares this morning at $950. The end result was a 50% gain in three months which I'm happy about, but it wasn't the double or triple I was hoping for. I felt like there were a few take aways from my short investment (2.5 months!) in CIBL. A precise intrinsic value calculation isn't necessary if you can buy with a big enough margin of safety. 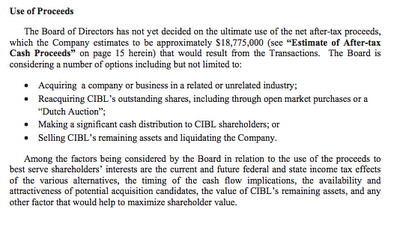 My range of $25-68m was large, but I purchased CIBL at $15m. The sale took place in my range guaranteeing me a gain. Even illiquid unlisted stocks become fully valued eventually. 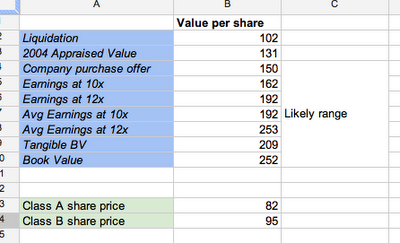 A shareholder who purchased based on managements original comments has between a 4.5x and 6x gain on their purchase. I was overly optimistic on my original assessment because I didn't understand some of the nuances of the partnerships. I read the filings but didn't totally understand exactly how the partnership breakdowns worked. This meant in my original assessment I attributed much more of a potential sale to CIBL then what would eventually go to them. This could have been a much bigger error, but again having a wide margin of safety saved me. I've mentioned in a previous post that I went through a list of 100 Japanese net-net stocks and scored them which resulted in 33 stocks that I want to research further. For the most part I will be reviewing the stocks in batches of three or four stocks at a time. This means there will be close to ten more posts about Japanese net-net's mixed throughout other posts in the future unless I see that no one's reading them. If the posts about Japanese net-net's suddenly disappear it's not because I've lost interest, it's because you the readers have no interest. One of the commonly asked questions I get when I post about Japanese stocks is how does someone go about purchasing them? Some readers might not feel comfortable trading directly in Japan, so I did a search of all ADRs from Japan and tried to match the ADR names to my research further list, one company matched. For readers that are interested I have included in this post information at the bottom about trading directly in Japan. US:TSSJF Doesn't trade often, call your broker before placing a trade, use a limit! Tsutsumi Jewelry is Japan's largest importer of diamonds from India and runs a very developed stone trading network worldwide. The company claims the volume of stones they move gives them a cost advantage over competitors. Once the precious stones are imported Tsutsumi Jewelry manufactures jewelry and then sell it via their network of company owned retail stores or online. The company operates 179 stores across Japan. The blurb describing their stores says they're comfortable and hospitable making customers at ease to come and go as they please. It sounds really nice but from the picture it just looks like a mall jewelry store, nothing fancy. The company has a nice website where you can browse jewelry and order online. The products looked nice, I have no idea if the prices were reasonable or not. I also have no taste in jewelry and my wife wasn't interested in browsing the website so I have no real opinion on the quality of this stuff. The company is currently selling for almost exactly the discounted net-net value. This means if you purchased today and the stock merely rose to NCAV you'd have a 23% gain. If you purchased and decided to sell when the stock reached an adjusted book valued (NCAV + PPE) you would lock in a 51% gain. -A large portion of their market cap is in cash. 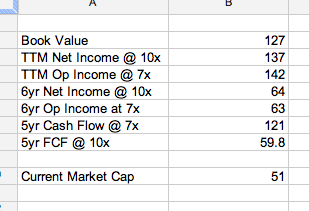 When I look at a net-net I want to have a margin of safety and cash flow that is supporting my margin of safety. In the case of Tsutsumi Jewelry the company has both, a significant discount to liquidation value and stable cash flows for the past five years. Capital expenditures have been steady and low, about 10% of CFO. The rest of the cash goes towards dividends and to the bank. For an investor looking to buy a Japanese net-net stock Tsutsumi Jewlery is really a perfect one to get started with. The company offers an English version of their website here. The company also offers quarterly financial statements in English published here. Lastly MSN Money has great data on Japanese stocks, here is the page for Tsutsumi Jewelry. I think Tsutsumi Jewelry is a pretty high quality Japanese net-net. For someone just starting out building a Japanese net-net portfolio this would be a perfect stock to add. The company has a large English language website, and has English filings giving an investor an extra layer of comfort. I haven't purchased any shares yet because I haven't finished my project of profiling my 33 selected net-nets. Once I'm done if Tsutsumi stands out I might end up purchasing shares. I think there are a lot worse stocks an investor could buy, Tsutsumi Jewlery seems like a pretty safe bet. There are three brokers in the US that allow trading of Japanese stocks, I have them listed and the markets they trade on below. ETrade - (Tokyo Exchange Only) Of the American brokers ETrade is the most at ¥3399 per trade. Interactive Brokers - (Tokyo Exchange Only) The cheapest on a per trade basis. Commission depends on the trade size, but it's usually only a few dollars. Fidelity - (All Japanese exchanges, Tokyo, Osaka, JASDAQ, Nagoya) Trades cost ¥3000 per trade. All three brokers charge a currency conversion fee based on the dollar amount you want to convert to Yen, pricing is on a sliding scale. Trading in Japan takes place between 8pm and 2am EST. Even for illiquid stocks I have always had a fill, not right away but within a few hours. I looked into both ETrade and Interactive Brokers and went with Fidelity as my broker. Fidelity can trade in 13 or 14 markets, ETrade only in 6. Interactive Brokers has access to a lot more markets but they penalize you with a no activity fee if you don't trade a certain amount of times per month. I'll sometimes go months with no trades and didn't like the idea of paying for my inactivity. Interested in trading in Japan in general? I highly recommend Steven Town's book Investing in Japan that I reviewed here. Price: $1750 (4/3/2012) - Note doesn't trade often beware!! I want to thank a reader who's an avid pink sheet investor for sending me some information on this stock along with a few others. The information sent was invaluable. Hershey Creamery is a ice cream manufacturer and distributer located in Harrisburg Pennsylvania. They've been in business since 1894 and were started by the Hershey brothers. Hershey Creamery is a completely separate company and has no relation to Hershey the candy company located in Hershey PA which is just down the road from Harrisburg. Hershey Creamery manufacturers both ice cream, ice cream novelties, smoothies, and ice cream coffee drinks. The company has an interesting distribution arrangement, they don't distribute to common grocery stores but rather distribute to stores where they can be the dominant ice cream product. This means if you're at a Giant Eagle you won't find Hershey Ice Cream, but if you're at MacBeth's Gift Shop in Cooksburg PA you'll find the freezer stocked full (I speak from experience regarding MacBeths). I've had Hershey Ice Cream in the past, but wanted to try it again before doing this post. Unfortunately the place that sells it near my house has either closed for good or hasn't opened for the season yet. We ended up getting some ice cream at a local place down the road which was awesome, but is a moot point in researching for this post. The company has been run by the Holder family since the 1920s. George Hughes Holder was the President and Chairman until he passed away in 2009. The company is now run by his three sons. Why is the company interesting? Hershey Creamery is a typical unlisted company, they run like a private company but have shares that seem to trade on an ad-hoc basis. The last time Hershey Creamery shares traded was January 23rd, when six shares traded hands. The company has 96,066 shares outstanding but most reside as treasury stock, there are only 35,359 outstanding, and the majority of those are held by the Holder family. Hershey Ice Cream is sold in 28 states. The company operates 22 distribution centers. They're still headquartered in the same place as where they started in the 1800s. In 2010 they had $94m in sales, $4m in operating income and $3.7m in net income. Hershey Creamery isn't a stellar business but they're pretty steady. If you take into account the overcapitalization they're probably close to fairly valued currently. On a cash plus operating business basis I can see maybe $2000 being a fair value, and $1750 isn't that far off, especially in the pink sheet world. Some people might argue that the company should trade at book value which would mean the company would be worth around $2565 a share. The reality though is Hershey will probably trade where it's at unless either earnings explode (unlikely especially with high fuel costs) or if the company is bought out. A buyout is the most likely way any value is going to be realized for a shareholder of Hershey Creamery. I was able to get some stats on ice cream company buyouts over the years from Adam at ValueUncovered (big thanks!) 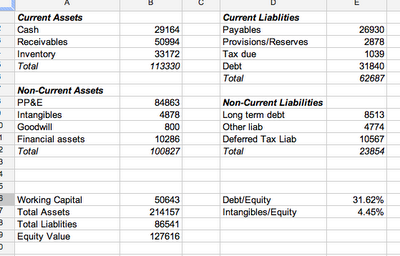 and put together a spreadsheet showing what that might mean for Hershey Creamery. 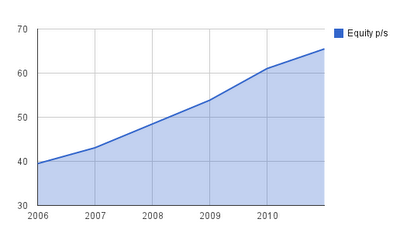 I used price to sales because this was the most consistent ratio I could find in the dataset. So going through the buyout data we get a range of possible values for Hershey going from $3706 a share to $10339 a share. All significantly higher than what it trades at today, but all betting that the family that has run Hershey Creamery since 1920 decides to sell. While there's significant upside for a shareholder if Hershey Creamery is sold I'm not optimistic that the company will actually be sold in the near future. George Hughes Holder's sons seem intent on running the business the same way as their father did including keeping a large hoard of cash and paying out a paltry dividend. If the company increased their payout, or something changed leading me to believe the sons were going to sell I would become very interested in Hershey Creamery, until then I'm content to watch them from the sidelines.